My shotgun epiphany came the first time I ever hefted a Boss game gun. It was one of a pair, dating from 1900, and the price of $40,000 (this was 1995) was about $39,900 more than I had on hand. Still, my taste was irrevocably altered. I embarked on a search for a comparable gun I could afford, and found one in the most unexpected of places: the rafters of a henhouse in rural Ontario. The old E.M. Reilly 12-bore was built in London in the 1890s on a barreled action that originated in Birmingham. It was made for a Scottish gamekeeper who used it hard and then passed it on to his son, who later emigrated to Canada. When the son died around 1970, the gun was nowhere to be found. It was finally discovered 35 years later when his widow was clearing out the henhouse. The author’s E.M. Reilly 12 bore after restoration. 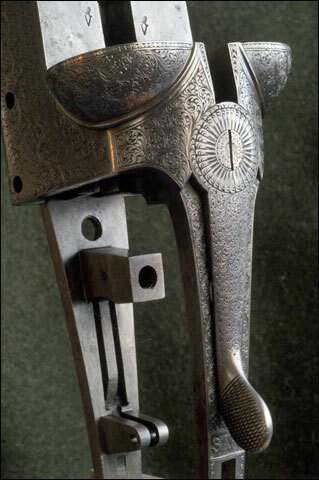 The gun was built on a Philip Webley-patent boxlock known as the screw-grip treble-bite. The original barrels were 30-inch Damascus, and the gun weighed six pounds, four ounces. Later, a set of fluid-steel barrels had been made for it, and both sets came in a rag-tag old Brady case — one set tied to the top with twine. The stock was oil-blackened and battered, too short for me and made for a southpaw, besides. The forend iron was all but corroded away, and the steel tip for the forend release was not much better. The checkering was gone, leaving only traces, and the drop points behind the action had been rubbed down to nothing. 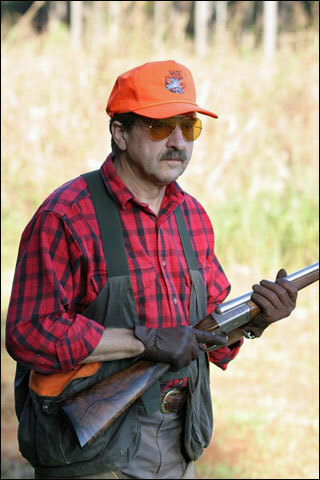 The author enjoys a day in the field with his E.M. Reilly 12-bore. I didn’t bother to take any “before” photos because I never expected there would be an “after.” I figured it would need restocking at the very least. However, I reckoned without the skills and determination of my Swiss gunmaking friend, Edwin von Atzigen. Two years and $4500 later, he had soaked the oil out of the stock, steamed out the dents and scratches, put on an ebony-type stock extension, bent the stock to cast-off, recut the checkering, refinished it with oil as only he can do. On the forend, he cut away the rotten wood around the forend-iron diamond, fitted a diamond of ebony to surround the new steel diamond, and a new steel tip. Both were sent to Sam Welch to be engraved in scroll to match the frame. The beautifully restored stock on the E.M. Reilly. There was additional internal work, including replacing the rusted main pin through the grip and retuning the ejectors. After this extensive work, the forend needed refitting to the barrels. Since there were minor dimensional differences between the two barrel sets, we chose to refit it with the Damascus. The result was a gun of the same vintage as that Boss of cherished memory. It may have been a gamekeeper’s boxlock, but it was definitely a Reilly “best,” built on the premium boxlock action of the day, with full-coverage engraving. Whoever the gamekeeper’s employer was − and we assume he was the benefactor − he obviously thought highly of him. 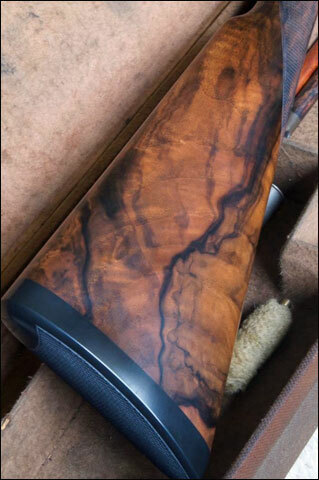 The stunning full-coverage engraving on the E.M. Reilly 12-bore. At this point I should add that the restored, original, French walnut stock on the Reilly is the most gorgeous piece of walnut I have ever seen. 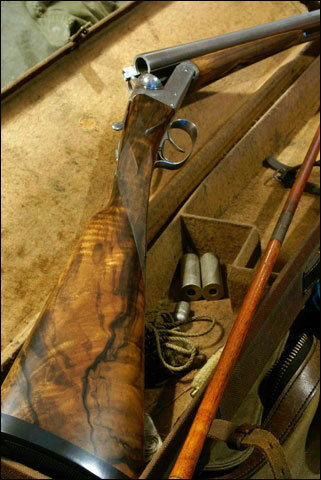 Reilly, being a second-tier gunmaker of the Victorian era, catering more to army officers and colonial civil servants than to the aristocracy, liked to put spectacular wood on their guns as a means of getting attention. They certainly got mine. My first experience afield with the Reilly was in 2007, during a rare opportunity to hunt wild quail on a plantation in Georgia. I’m happy to say that the Reilly collected a couple of birds that day, and it’s been my lucky gun ever since. A pheasant taken with the author’s E.M. Reilly. The chambers are 2-5/8 inches, and the proof is black powder, but the Damascus barrels are completely sound, and I shoot the 2 1/2-inch Baschieri & Pellagri “High Pheasant” one-ounce loads of #7 for everything from quail to wild pheasants in South Dakota. That load is now discontinued, alas, but I’m sure I’ll find something comparable from RST when my supply runs out. As you might imagine, a six-pound, four-ounce 12-bore with 30-inch barrels could have extraordinary balance, and the Reilly has it in spades. It comes to the shoulder of its own accord, and provided I don’t get in the way, it downs birds with remarkable alacrity. 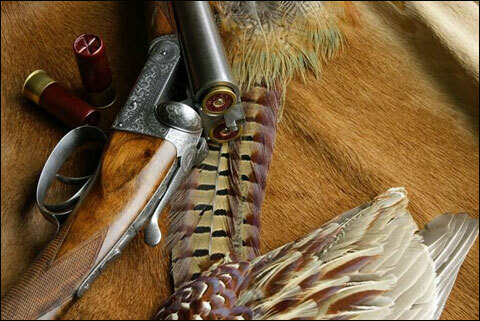 Its first trip to South Dakota, in 2008, it downed 13 pheasants with 15 shots − all wild roosters, I might add. The gun is old and led an undeniably hard life, so I don’t shoot it as much I would like, and I take care never to strain it. But whenever I blunder into a slump, I take it out to remind myself of what a perfectly balanced gun feels like, and pretty soon I’m hitting things again. That E.M. Reilly is the last shotgun I would ever part with. Terry Wieland is Shooting Editor of Gray’s Sporting Journal, and the author of Vintage British Shotguns (2008) and Spanish Best: The Fine Shotguns of Spain (1994 & 2002).